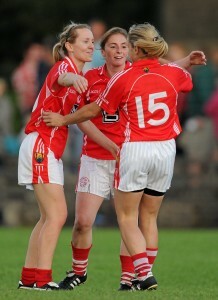 CAPTAIN Amy O’Shea scored a hat-trick of second half goals against Laois on Saturday evening as Cork cruised into the final of the 2011 TG4 All-Ireland Ladies senior football championship. O’Shea struck a killer brace within a minute shortly after half-time, to knock the stuffing out of a Laois side that had been level at the break, 1-3 apiece. And from there, it was routine stuff for the Leesiders, who repeated their Bord Gáis Energy National League Division 1 final victory against the same opposition, but with a much greater degree of ease on this occasion. The scoreline could have been much worse from a Laois perspective but for goalkeeper Ciamh Dollard, who saved two penalties before denying Nollaig Cleary with a point blank save towards the end. Level at the break, having played against the breeze in the opening half, Cork fancied themselves to come through and set up a final meeting with Monaghan or Kerry on September 25 at Croke Park. But the Rebelettes had to recover from a sluggish start as Laois were 1-3 to 0-0 ahead with just 12 minutes on the watch. But the Leinster champions, conquerors of last year’s beaten finalists Tyrone in the quarter-finals, would not score again before half-time. And they were outscored by 0-3 to 3-7 in the second half as Cork, five-in-a-row All-Ireland champions from 2005-09, turned up heat. Cork suffered a shock quarter-final defeat against Tyrone in last year’s quarter-final but have roared back into contention with a stunning run of summer form, kickstarted by that League success. And now former champions are just 60 minutes away from winning the Brendan Martin Cup for the sixth time in seven seasons. Cork were rocked in the third minute when goalkeeper Elaine Harte made an uncharacteristic error, allowing a speculative long rang effort from Laois forward Martina Dunne through her grasp and into the net. Scores from Tracey Lawlor (two frees) and Dunne sent Laois into a six-point lead before player of the match and midfielder Juliet Murphy opened Cork’s account with a 16th minute free. And Cork were level by the 29th minute when full-forward Rhona Ni Bhuachalla crashed a stunning shot into the top corner for her team’s first goal. Cork could have gone in ahead at half-time but after a foul on Ni Bhuachalla, the normally lethal Valerie Mulcahy saw her penalty saved by Dollard. In a remarkable sequence of events, Mulcahy missed the follow-up while O’Shea was also off-target as the Laois goal led a charmed existence. Ní Bhuachalla missed another decent opportunity early in the second half before O’Shea scored two goals in the 34th minute of actual playing time. Those strikes knocked the stuffing out of Laois and it was routine stuff for Cork until the finish. O’Shea completed her hat-trick in the 48th minute before Dollard stopped a Ní Bhuachalla penalty in the 61st minute, after the goalkeeper had fouled marauding wing-back Briege Corkery. There was still time for Cork to threaten the Laois goal again but Cleary’s shot was brilliantly tipped over by Dollard. Scorers for Cork: A O’Shea 3-0, R Ni Bhuachalla 1-1, J Murphy 0-4 (3f), N Cleary 0-3, M Kelly & G Kearney 0-1 each. Scorers for Laois: M Dunne 1-1, T Lawlor 0-3 (2f), Mary Kirwan (f) & G Weston 0-1 each. CORK: E Harte; AM Walsh, A Walsh, D O’Reilly; B Corkery, B Stack, G O’Flynn; J Murphy, R Buckley; N Cleary, M Kelly, G Kearney; V Mulcahy, R Ni Bhuachalla, A O’Shea. Subs: N Kelly for Buckley (53), L McMahon for Kelly (58), A Sheehan for Kearney (60), O Farmer for O’Shea (60). LAOIS: C Dollard; L Hyland, G Dunne, E Healy; A Taylor, J Moore, M McEvoy; A Casey, T Lawlor; Mary Kirwan, A Moore, M Dunne; P Fogarty, S Doogue, G Weston. Subs: Martha Kirwan for Dunne (59), O Farrell for Casey (59).